Home » How do I get involved? Go to the GeoCitizen platform and start creating points of interests with your ideas and observations how to solve problems or start iniciatives in your neighborhood or city on the map and share them with your neighbors or other interested people. 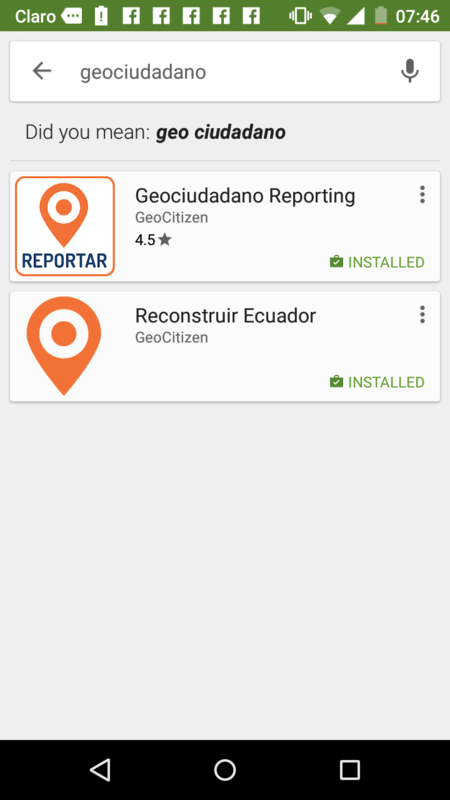 In order to do this you need to download the GeoCitizen (Geociudadano) Report App (available for free at the Google Play Store and App Store) and review the user manuals and the potential of the GeoCitzen App. You can then review the observations you made as well as observations made by others. The desktop version of the application is available at http://geociudadano.org, as well as some of its sub-domains in Quito, Cali, Galapagos, and other places. The desktop platform of the GeoCitzen offers more functionalities like access to a discussion forum, possibilities to upload proposals and ranking, and voting tools for the users in order to find solutions to their problems and observations in their neighborhood. The obtained results are subsequently and automatically published on the platform. You can go to the Blog of the associates GeoCommunities to leave comments and to contribute to the community with pictures, texts and links to other websites or documents. You can share your ideas on the Facebook page created for several GEOcomunities, where you start discussions, and share your ideas and possible solutions of reported problems in your neighborhood.